Besides the Katrina Quilt square, and some light mending, I haven't figured out a way to sew since Adelaide was born. Oh well...it's still early and I have faith that I'll find my way back to the machine. I have, however, had plenty of time (okay, well maybe "plenty of time" isn't the best phrase...let's just say a few minutes a day!) for knitting thanks to our sudden burst of late night TV watching. We're catching up on season four of Six Feet Under, and of course, the Red Sox. Go Sox! (Steve calls me a playoff fan because I ignore the 500 games-I swear that's an accurate count-- prior to this point in the season, and now I'm all jazzed up about baseball at the end). But I digress. Back to knitting. 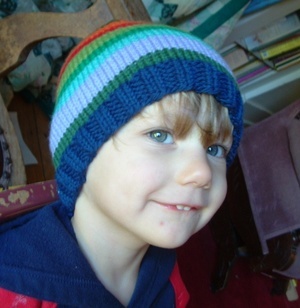 Here's the hat I knit up for EzzaBoo during all the TV watching last week. 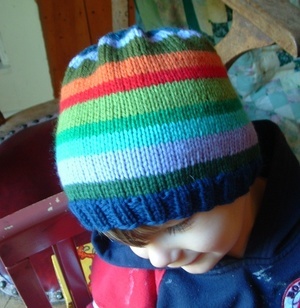 It's with leftover yarn from the Wild Stripes blanket, which I swear is almost done (the knitting is done! I just need to back it, and like I said, sewing time is hard to come by these days). I'm so psyched, because the yarn was so cheap to begin with (from KnitPicks) and I made the entire (huge) baby blanket, and will have enough leftover for hats for all three kids (all deserving of their own posts upon completion in the near future, of course). Makes me feel all good and thrifty. I'm happy with how this turned out, considering I've taken a few years off from hat making, and totally wung the pattern based on guesswork. Yipee! My brain still works!